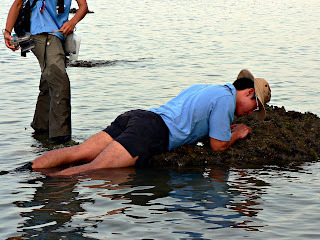 It was a very sleepy morning as I just alighted my plane from Shanghai and rushed to Sentosa for the TeamSeagrass transect. I was the first to reach the Ben and Jerry's and it was kind of weird to see Sentosa so quiet (it was just me and the guard there). Anyway, we headed down to the transect area after waiting for NParks who were late as usual. The tide was quite high when we reached there so Shufen gave us a briefing on the random method we were going to use. We tried to wait out the tide by having some food but as luck might have it, the tide did not really go down. We then decided to explore the place instead. One thing I realised at Sentosa which I did not see at the other places was an abundance of coralline algae growing on the rocks. 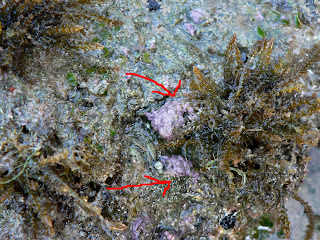 Coralline algae are a type of marine algae that is hard, unlike your usual Ulva or Chaetomorpha because they deposit calcium carbonate into their cell walls. The reason why I am very interested in coralline algae is that they have key roles in reef building. When they grow in sheets coverig rocks and substrate, they deposit considerable amounts of calcium carbonate, sometimes even more than corals and thus constitute to reef growth. 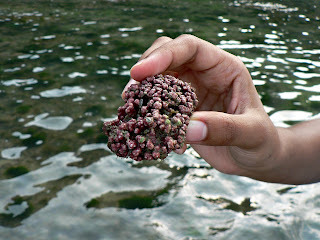 Another reason why coralline algae is important to reefs is that they keep it from being washed away by crashing waves. When these algae encrust onto a substrate and builds on it, it forms a sheet that can withstand the strong currents of crashing waves that even the most rugged corals would be washed away. The coralline algae also forms what is called an algal ridge when they grow on the outer reef edge. This algal ridge will sort of cushion the force of the strong water currents and prevent the reef from being eroded away. One last importance of coralline algae to reef building is that it works as the reef's superglue. This is an important role because if the sediment are not bonded together, fine sediment will damage corals when they settle on them. When coralline algae grows over a sediment substrate, it literally bonds the substrate together, creating a solid structure for corals to grow on and prevent any loose sediment from settling on the corals. The reef in this case grows via both the binding of sediment and the growth of corals. Algaes that deposit calcium carbonate into their cell walls like Halimeda sp. generally also help in such functions in one way or another. Talking about algae, I also noticed quite a few patches of what seem to be Chaetomorpha sp. or commonly called "speghetti algae". These algae are also quite different from the rest because it does not permanently attach itself to a substrate. If you'd notice, macroalgae like and Caulerpa sp. and Sargassum sp. 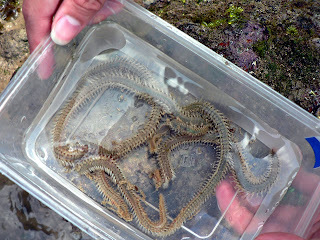 attaches itself tightly to a substrate and would not get washed away in the tide. However, Chaetomorpha sp. is just a bunch of free floating algae that does not possess any structures like runners to attach to a surface. This led me to think, maybe it is an adaptation for them to maximise photosynthesis. I noticed that although they cannot attach to a substrate, they do get "caught" on rocks when their bunch of curly whirly strands act like some sort of velcro. They then stay there until the currents detach them and they go with the flow till they get caught at another rock. This, I think, allows almost 360 degrees of photosynthesis to occur since the bottom strands are shaded until they get a chance to receive sunlight when the bunch flips and turns in the currents when they are detached. I'll try to illustriate my point next time with pictures. Anyway, Wilson the "worm guy" from NParks was also out catching, yes you've guess it, worms! I hope he won't mind me showing this pic of him in action trying to coax a Eunice sp. out of its hole. Shufen even challenged him to find 3 worms for a lunch treat and guess what, Wilson overturned a small rock and using his chopsticks, picked out 8 worms! There were even more squirming in the sand!